Rafi had a very sweet relationship with Shankar Jaikishan but unfortunately their relationship had not been glorified in bollywood history. Whenever contribution of composers relating to classic creations involving Rafi are highlighted the name of Naushad, Roshan, Madanmohan, OP Nayyar are glorified and the contribution of Shankar Jaikishan is ignored. If Rafiâ€™s stylish andaz relating to westernized compositions are adequately utilized it is Shankar Jaikishan who had used it to perfection. They had used Rafi for singing romantic songs with Japanese orchestration in Love in Tokyo including songs like â€œaja re aa zara aaâ€, â€œJapan, Love in Tokyoâ€, â€œ o mere shahekhubaâ€, etc. In Biswajeetâ€™s April Fool SJâ€™s composition for Rafi including â€œaa gale lag jaâ€ had westernized background. SJâ€™s composition for Rafi in Shammi Kapoorâ€™s An Evening in Paris like â€œakele akele kahan ja rahe hoâ€, â€œraat ke humsafarâ€, had loud French music with echo effect and Rafiâ€™s intonation was also westernized. Shankar Jaikishan gave a completely different style of music to Rafi in Rajender Kumarâ€™s Aarzoo with songs like â€œaji ruth kar abâ€, â€œchalke teri aankho seâ€, â€œai nargisi mastanaâ€, etc. SJ had given songs addressing children to Rafi including â€œnanne munne bache teri mutthi me kya haiâ€ in Boot Polish, â€œhai na bolo boloâ€, â€œre mamma re mamma reâ€ in Shammi Kapoorâ€™s Andaz and â€œchakke pe chakkaâ€ in Brahmchari. Rafi pronounced the words with childish accent and SJ used the orchestration to attract children. There were ghazals also given by SJ for Rafi including â€œrukh se zara nakabâ€ in Jeetenderâ€™s Mere Huzoor, â€œunke khayal aye toâ€ in Raj Kumarâ€™s Lal Patthar, etc. Besides SJâ€™s creation involving Rafi in somber mood had created great impact including songs like â€œteri zulfon ki judai to nahi maangi thiâ€ in Dev Anandâ€™s Jab Pyar Kisi Se Hota Hai, â€œehsaan tera hoga mujhparâ€ in Shammi Kapoorâ€™s Junglee, â€œyaad na ayeâ€ in Rajender Kumarâ€™s Dil Ek Mandir. Shankar Jaikishan had used Rafiâ€™s classical andaz in the songs â€œradheke tune bansoori churaiâ€, â€œajahu na ayeâ€, etc., and combined the ragas with devotional andaz. SJ ha given music in almost 200 films within the span from 1949 to 1971, and at least each year they composed music for approximately 10 films. As Rafi was given predominance over other male singers SJ had use him in regular intervals even without doing injustice to Mukesh, Manna Dey, Kishore Kumar, Talat Mehmood and others. Songs like â€œkaun hai jo sapno me ayaâ€ from Jhuk Gaya Aasman, â€œto bura maan gayeâ€ from Ayee Milan Ki Bela, â€œyeh ankhenâ€ from Jab Pyar Kisi Se Hota Hai, â€œtujhe jeevan ki dor seâ€ from Aasli Nakli, â€œdheere dheere chalâ€ from Love Marriage, â€œbadan pe sitaren lapete hueâ€ from Prince, â€œmai kahin kavi na banjayunâ€ from Pyar Hi Pyar, â€œmai gayun tum so jaoâ€ from Brahmchari, had not lost their flavour even 40 years after their creation due to sheer brilliance of Shankar Jaikishan. It is really tragic neither Shankar Jaikishan had received the accolades that they deserved nor Rafiâ€™s association with them had been glorified but history says that the combination of Rafi with Shankar Jaikishan had produced invaluable creations which had become immortal over the period of time. This entry was posted on Sunday, September 28th, 2008 at 11:54 am	and is filed under Meri Awaaz Suno. You can follow any responses to this entry through the RSS 2.0 feed. You can leave a response, or trackback from your own site. yOU HAVE NICELY REVEALED THE FACT. MY EYES BECAME FILLED WITH TEARS. IN FACT I AM 59 BUT A GREAT FAN OF SJ. PLEASE CONTINUE SUCH ARTICLES. GIVE US A DEVOTIONAL PLEASURE. Please, do not argue between musicians. SJ was commercially most successful, while the likes of Naushad refused to sign movies on principles. For example, the music of AZAD was first given to Naushad. The producer wants the song just in few days. Naushad returned the deposit. SJ would not do that. He will compose within few days. Naushad will not. SJ would allow RK to sit in the recording room, while Naushad as asked even the stalwart and titan like Mehboob Khan to leave the studio. They are different. They are all good. Dilip Kumar has acted far fewer movies than other superstars. Can you compare them to DK. Who remember Dharmendra, Jitendra, Rajendra, Manoj Kumar, Shammi Kapoor, Shashi Kapoor and even Rajesh Khanna and many others. They are forgotten, unless somebody is a crazy follower of them. Can the industry forget Dilip Kumar. No way. It is a bench mark. Actors are not only known by acting, but the choice of movies. Naushad will be remembered by Mother India, Mughal E Azam, Andaaz, Dulari, Ratan, Anmol Ghadi and others. Who can forget the music of Guide by SD. The greatness of an artist or sportsman or anybody is not by sheer numbers, but when, where, why, against who, for what all inclusive. If numbers matters, then the greatest artist would be Dharmendra, Rajesh, Jitendra, Shahi and many others. That is not the case. The topic is, sorry, quite incorrect. It was an all out effort, in the media to highlight SJ with Mukesh. That should have been the topic. As far as Rafi is concerned, SJ could not even have survived without Rafi. It is impossible to think SJ songs without Rafi. Rafi was artery of SJ music. Yes, I agree that they have given amazing songs. Throughout 60’s, from middle of 50’s they have given songs after songs. Mukesh was invited to sing only when RK was hero, otherwise, Rafi is the only singer filling the demand. Hardly SJ has taken the voice of Kishore Kumar and Mahender Kapoor. Very rare. Mukesh due to RK otherwise, Rafi is the bet for SJ. I sometime imagine what a wonderful competetion it would be if 10 best songs ( though we all know it is difficult to choose, but let’s take it for granted it has been choosen ) of Md Rafi sahab sung in the composition of great Shankar-Jaikishan duo are placed beside 10 great song Md Rafi had sung under each musician, SD Burman, Naushadji and let me include Madanmohan and Raviji too ( altogether no of songs would be 50 with five musicians ), then which Music Director would score first? Shankar Jaikishan will have an edge here over others, not in terms of their great quality of music, but Md Rafi had sung more number of songs compared to other contender musicians I have mention above. Anyway, whom would you guess might come first, I mean which music director? Certainly it would be an interesting competition no doubt…!!! rafi sab hamare liye bhagwan se kam nahi hai.O GOD IF YOU CAN DO ANY FAVOUR TO THIS WORLD OF MUSIC,PL SEND HIM BACK TO THIS WORLDAS WE ARE SUFFOCATING DUE TO DRY MUSIC SUPPORTED BY NON SENSE SINGERS.RAFI SAB, WE SALUTE YOU FOR YOUR CONTRIBUTIONS TO THIS WORLD OF MUSIC AND WE ALL LOVE YOU FOREVER.MAY GOD LISTEN TO OUR PRAYERS. rafi sab is a unique singer and self developed.This is why he is in the hearts of millions of people.No doubt no body of like rafi sab,before him or after him and do not expect this.Rafi sab aap jisa singer naa hi pahele paida hua naa hi paida hua,aapka ki is amrut bhari aawaz salamat rahe sada aur aap hi pahala aur aakhri samrat hai is sanget bhari duniya mein.bhagwan aap ki aatma ko sada sukhi rakhen. I have born in 1943, at hyderabad a holy place where the genious shanker(shankerjaikishan)has spent his early life playing tabla in the local temples, his associates, gurus also i know,one ustad dawood, the famous tablist,and other yester year hero chandra shekharji. It was during the ending of 1950 , I developed great interest in music ,after continuously listening the ryhthemic light classically based songs of shankerjaikishan, and by 1960, i formed a group of music, all my friends,we frequently used to sing bhajans, and all devotional and musical compositions of shankerjaikishan,I used to play dholki,,and my friend hormonium,and onother friend ghungroo,our cmbination ofmusic and singing was so impressive and famouse that we were asked to repeat such songs even six times in big theatres lke ravindra bharati, because all these songs were of shankerjaikishan compositions,,like sur na saje, bhai bhanjana,duniya na bhae mujhe, all from basanth bahaar, murali bairan bhayee from new delhi, radhike tu ne,from beti bete, aye bahaar banke lubhaker chale gaye, from raaj huth, aj woh na aaye balama savan beetha jaye, from sanjh aur savera, like this, weakly 5 days at temples, and 2 days at home in our music room.we the team was so perfect that with in the fraction of seconds the begning of music we could identity the song, lyrist,singer,and film, this trend continued till1975.the last musical hit of the shankerjaikishan!s Sanyasi, after that ,4 members of our group expired,only we two are there,we actually hate todays music,I have all the 215 pictures of shankerjaikishan songs cassettes with me i daily listen at least for 3 to 4 hours a day,wich gives me complete mental peace, and health.In seventees we came to bombay, met shankerji at home at noriman point and also at office at mahalakshmi, famouse cine building,spoke to shankerji,presented few songs, who was very kind enough to take us in his fiat car to recording studio, introduced sri mannadeyji and shardaji,we also met jaikishanji at gaylords, and chandra shekharji, at andheri,now only those memeories are giving me solace, and health,Till my last breath we can not forget the legends and their music, not only me but it is trend in hyderabad, in most of the functions only shankerjaikishan songs are played.jai ho shankerjaikishan. I have no more words to up lift Rafi sb with Shanker jaikishan, Its just Suraj ko Chrag dekana. I think Its shanker jaikishan who made Rafi as verstile Singer. As for Other Music Directors of that Eara, had limited range. Shanker Jaikishan having Unlimited range of music, Rafi Sb gave some of the Classic songs with S.J. And other most popular public liking Songs with S.J ! HOW MANY OTHER MUSIC DIRECTORS GAVE MUSIC IN 200 FILAMS, Is there any other Music Directior whose name was sold & Distrbuter buys the movie Just for the sake of Music Direcrors. Shanker jaikishan movies were sold as Hot cake…. I enjoyed all comments & liked except Kapil’s. in the crowd of Naushd, sdb, c ram. Roshan, madanmohan etc. the Shahenshah, Samraat & the Greatest is only SHANKAR JAIKISHAN. & there is no one who can reach SJ’s level. – Not a naushad or a r rehman. Sj is the greatest. After 50 years today also they are rulling by their music. If one is familiar with Hindi Films songs down the years since 1948 and noting the variety of songs of Mohd Rafi saab sung for the great SJ clearly reflects their variety and versatility. Other composers may find difficult to reach their talent. I am one of the greatest fans of SJ.and do not rate anyone above them.Shankar in one of the interviews quoted about S.D. Burman praising the duo’s work.S.D. infact had said IS INDUSTRY ME HAR COMPOSER KI KUCHH TUNES CHALTI HAIN KUCHH NAHI CHALTI LEKIN SHANKAR JAIKISHEN KI YEH KHOOBI HAI KI WO JO TUNES BANATE HAIN SUB POPULAR HOTI HAI.The space is too short for expressing my feelings.Whenever I visit Mumbai (I stay at Bhopal ) I invariably visit Shankar Jaikishen Chowk. SJ ,undoubtedly the greatest of all the duos gave Rafi some of his best. How long did Jaikishen live after 1969 ?He died in 1970 and perhaps had the opportunity to compose only for few films like Tumse Achcha kaun hai,Andaz ,Mera Naam Joker ,and Patanga which were all released in the early 70s. And in all these filsm except Mera Naam Joker they gave Rafi his due. However, after 1969 they also experimented successfully with Kishore Kumar. It is absurd to say that RK ditched SJ and opted for LP ,which is not true .In fact, Raj Kapoor mentioned in one of his interviews on the TV that he gave up hero roles because Jaikishen,Mukesh and Shailendra had all passed away and no one can replace them. It is important to mention here that Raj Kapoor also gave up Lata for SJ in Mera Naam Joker ,that was the kind of loyalty he had towards them. SJ were also greatly responsible for giving Lata her own recognition. But it seems that towards the end their relation had strained and SJ stopped using Lata . It should be noted that Jaikishen died in his early 40s in the year 1970 only after which people seriously started recognising LPs music.But the fact remains that LP compromised on the quality of their tunes and never really came anywhere close to SJ .In fact it is ridiculous to even think of comparing LP with the magic wizards SJ. However, Shankar’s music after his partner Jaikishen’s death steadily deteriorated and went something like aiyo na maro in one of his last movies. The 70s saw the end of the golden era with deaths of S.D Burman,Jaikishen and Madan Mohan .Also Naushad could not recreate the magic of the 60s. O P Nayyar , another big name in 50s and 60s became helpless without Asha and his composotions were never again the same. The reason why SJ’s relationship with Rafi is not glorified is because they dumped Rafi after Aradhana and switched vehemently to Kishore..”Main sundar hoon”,”Aankhon aankhon mein”, “Kal aaj aur kaal”, “Beimaan”,”Jungle mein Mangal”- SJ in 70s were entirely changed from SJ in 60s..Although the quality of output came down a lot, but still, at that time of crisis in Rafi’s career, SJ could have helped him better-rather they shifted to kishore full fledgedly like SDB and Kalyanji Anandji-once Rafi loyalists. Shankar -Jaikishen were the divinely inspired musicians. They were the victims of politics in the Bolliwood music industry. In the later half of their career they were completely sidelined by Lata Mangeshkar who allegedly promoted Laxmikant & Pyarelal whose whole career was built upon plegiarism of SJ’s tunes. It is said that Lata Mangeshkar had demanded an unfair share from the royalty of their musical compositions. Without SJ Rajendra Kumar would never have become successful.But he also became selfish and forgot his benefactors and signed a contract with R.D> Burman for his home production starring his own son Kumar Gaurav. Dharmender had also gone back on his words when he did not keep his word to Shankar that he would sign him for his film Bicchu directed by Sai Paranjape. To cap it all Raj Kapoor deserted the great musicians when he invited Laxmikant Pyarelal to score music for Bobby. It was a very humiliating experience for them when during the Premier of Kal Aaj Aur Kal they had to see their mentor signing with LP. It is alleged that at the behest of Lata Mangeshwar a number of SJ’s musicians were encouraged to join the camp of Laxmi-Pyare. A number of such behind-the-curtain evens , politics in the bollywood affected. However. it would not be an exaggeration to say that they would be the First and the Last musicians who exhausted all the possibilities of experimentations in the field of film music. They will continue to inspire minds of posterity through their immortal compositions.Rafi’s association with them is unforgettable. Unde the guidance he sang in different voices for Rajendra kumar , Shammi Kapoor, Dilip kumar,and others. SJ were one pair of Music directors who knew their job and were judicious in using the singers. Unlike Naushad Sb who gave song after song in Rafi Sahib’s voice and ignored Mukesh ji, Manna Da, Kishore Da and literally dumped Talat Sb. This perhaps is the reason how their music sounded fresh. They shared exceptional relationship with most of the leading singers be it Rafi Sb, Mukesh Ji or Manna Da. That was the reason for churning out gems after gems. One dear friend has written in his post that Mukesh ji was hopelessly outclassed in Dost Dost na raha (Sangam) by Rafi Sb’s ye mera prem patra. I think personal opinion must not be made a rule. Both the songs are great and it will lead to a conflict between the fans of two legends. No one can ignore a fact that Rafi Sb has sung about 2600 songs (Although his ardent fans claim it to be 26000. I advise them to refer Mr Harminder Raj Singh’s Hindi film Geet Kosh). Mukesh ji on other hand has sung 1100 songs. The uniqueness of these legends never made them competitors and they both remained admirers of each other and great friends too besides being the humble human beings. The present lot of singers have alot to learn from them as singers and humans. SJ no doubt were out of this world. No one can replace them. With the help of media and sponsored publicity present day composers can make big claims but I challange if any one can touch the following gems of SJ all in different voices. 1. Jane Kahan gaye woh din. 2. Yad na Jaye beeto dino ki. 3. Tu Pyar ka sagar hai. 4. Ruk Ja raat thehar ja o Chanda. 5. Zindagi ik safar hai suhana. 6. Unhe tu bhool ja aye dil. 7. Parde mein rehne do. 8. Rula kar chal diye ik din. From 1949-1960, I’d rate S-J in the Top 3 of MD’s along with SD, Naushad, CR. There is absolutely no doubt that the other three produced gems during this period, but in my view S-J were no less. Looking at S-J, during 1949 to say the mid 50’s, they catered more to Lata, and made more female based songs, probably because the films they worked for needed only those types of songs. What is astonishing is that even from 1949 to around 1960, Rafi still sang slightly more than Mukesh for S-J (I have done some research and came to an interesting conclusion). So while its true that the Rafi-SJ combo flourished in the 60’s, they gained momentum in the 50’s, and have quite a number of gems during the 50’s too. Lata and Mukesh ofcourse received great songs from S-J during this time too (and after). I rate S-J as good as the others in the 50’s, because of their revolutionary aspect, just like RD in the 60’s and 70’s, S-J virtually changed film music and set new standards and trends combined with quality, that others had to match their consistent output. If we look at the excellent trio of Lata, Rafi, Talat, we will see that S-J used them all very nicely in the 50’s as well. Talat has beautiful songs with the duo during this period including many of my favourites from Daag, Aas, Patita, Shikast etc. Where would you rank S-J in the period of 1949-60? well, it’s a well known fact that from 1960 onwards S-J became more regular with Rafi Sahab and together they ruled there onwards commercially and their quality was great as well, i love all those dance numbers, romantic numbers,classical numbers of S-J-Rafi combo but in the period of 1949-60 musical tastes were different, those days the highly classy MDs such as–Naushad,Roshan and C Ramchandra were commercially successful too, no doubt that S-J came with superb qualtiy there also but in quality i would rate Naushad,dada and CR slightly above than S-J. now if you look at Naushad, his 40’s output is no way inferior to his 50’s, he was mind blowing in 40s too, just to recall few of his albums–Shehnshah, Ratan,Anmol Ghadi,Dard all of them were superb and divine albums. year 1949 was 1st peak of excellence for naushad-Rafi, remember those 3 Rafi solos– “Is dunia mein aey dil walo”, “Tere kooche mein armano ” and “suhani raat dhal chuki” . Lata’s career also flourished under Naushad, Naushad extracted something different out of Lata(Like Anil b,Cr and LaterMM and S-J)–perfect example is “Uthaye ja unke sitam aur jiye jaa”. 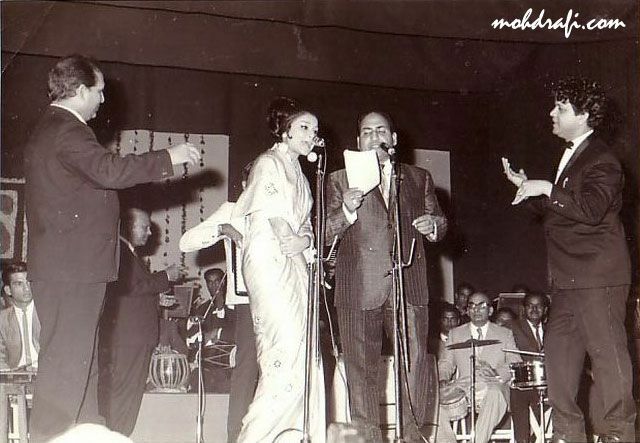 i love the era of 1949-60 as my 3 most favourite sigers(Rafi,Talat and Lata) were most active and spread the magic through their vocals….. so, where would you rate S-J here? One more thing I want to bring to the knowledge of all that Jaikishan Sahab’s full name is not Jaikishan ‘Dayabhai’ Panchal but it is Jaikishan “Dahyabhai” Panchal. “Dahyabhai” is a very common name in vogue in Gujarat and here it stands as the name of his father. SJ and Rafi combo ke baare mein to jitna kaha jaye kum hi hai. What a lovely song they have composed in An Evening In Paris “Mera Dill hai tera, tera dil hai mera.” Though not as much popular as other songs of the same movie but just listen to the song and feel the sheer brilliance of not only the composition but also the orchestration and recording of the song for which they are widely known. In fact what I feel words are not enough to describe the pristine purity of their numerous creations. SJ and Rafi combined well in the film Suraj. The relevant songs include “baharon phool barsao”, “gustaqi maaf”, “kaise samjhayun”, “itna hai tujhse pyar mujhe”. The combination gave super hit songs in Ayee Milan Ki Bela – like “aha ayee milan ki bela”, “to bura man gaye”, “o sanam tere ho gaye hum”, “tum khamseen ho”, etc. They did extremely well in Jhuk Gaya Aasman too with songs like “o priya”, “sachha hai”, “kahan chal diye”, etc. Shankar Jaikishan gave brilliant tunes to Rafi in films of Dev Anand like Asli Nakli, Jab Pyar Kisi Se Hota Hai, Pyar Muhobbat, to name a few. The notable songs include “jiya ho jiya ho jiya kuch bol do”, “sau saal pehle”, “yeh ankhen uff umma”, “teri zulfon ki”, “dil ki awaaz khuda khair karen”, “pyar muhobbat”,”ek boot banayunga”, “tujhe jivan ki dor me”, etc. He showed the audience that Rafi could adapt to the dialogue delivery style of De Anand and sang very melodious songs under SJ all of which were super hits. Teh credit goes to SJ to discover Rafi’s capability of matching Dev Anand’s style of giving lips in films. In Response to the question of Mr. Narayan, Rafi had sung even 5 times the songs of SJ if compared with Mukesh. The reason was ver obvious, SJ had used Mukesh only in films of Raj Kapoor and Manoj Kumar. Rafi had been used by SJ in films of Shammi Kapoor, Rajender Kumar, Biswajeet, Joy Mukherjee, Dev Anand, Shashi Kapoor, Pradeep Kumar, to name a few. The number does not matter. What matters more is that SJ had used Rafi for every type of song that can be composed for bollywood films including bhajans, semi-classical songs, rock and roll songs, folk songs, etc. The song “radheke tune bansoori churai” has no similarity with “akele akele kahan ja rahe ho”. “aji ruth kar ab” has no similarity with “aaj kaal tere mere pyar ke charche”. The list can go. Articles after articles can be written on the outstanding relationship of SJ with Rafi. Rafi had sung many semi-classical songs for SJ over a span of time including “awaz deke hume tum bulayo” in Professor, “to bura man gaye” in Ayee Milan Ki Bela, “ajahu na aye” in Saanjh Aur Sawera, “aji ruth kar ab” in Aarzoo, “o mere shahekhuban” in Love In Tokyo, to name a few. Shankar Jaikishan had used the westernised andaz of Rafi more than other composers in bollywood films, yet when the relationship of Rafi with renowned composers is discussed the names of Naushad, Roshan, OP Nayyar, Madanmohan gets predominance which is unfair for Shankar Jaikishan. Nov.16 , 2008 a grand shankar-jaikishan concert at GCC club, Mira Road, near Mumbai. Singers are Shrikant Narayan, Vrushali Patil, Sagar, Kumar Subu, Jignesh vora, Aparna , and Joginder pal kakaji. the event will begin at 6.30 p.m. , is staged by rafi foundation, mumbai and is free to its members. binu nair…….cell 9833 250 701, mumbai. Rickshawala mein Rickshawala sung for Mehmood in the film Choti bahen sung by Rafi Saheb (composed by SJ) in an altogether differnet mood is one of the popular song during 50s. Not to forget immortal song ,purely classical , which I firmly believe could not and cannot be sung in the same style by any other singer (other than probably manna dey ) , as rafi saab under sj ,from Basant Bahar ..duniya naa bhaye mujhe ab to bulaa le charno mein ..